Marking the 23rd anniversary of the Srebrenica genocide, Turkey’s president on Wednesday vowed joint efforts to prevent further crimes against humanity. 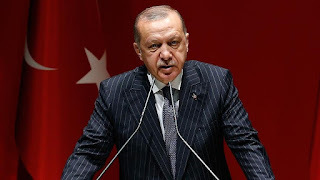 “I wish God’s mercy on our Bosnian brothers who were martyred in the Srebrenica Holocaust, which happened 23 years ago before Europe's eyes, and I saw as one of the most shameful incidents in history,” Recep Tayyip Erdogan wrote on his official Twitter account. “We will struggle together to prevent such crimes against humanity from recurring,” he added. More than 8,000 Bosnian Muslim men and boys were killed when Bosnian Serb forces attacked the UN "safe area" of Srebrenica in July 1995, despite the presence of Dutch troops tasked with acting as international peacekeepers. Srebrenica was besieged by Serb forces who were trying to wrest territory from Bosnian Muslims and Croats to form their own state. The UN Security Council had declared Srebrenica a "safe area" in the spring of 1993. However, Serb troops led by General Ratko Mladic -- who now faces genocide charges at The Hague -- overran the UN zone. The Dutch troops failed to act as Serb forces occupied the area, killing about 2,000 men and boys on July 11 alone. Some 15,000 Srebrenica people fled into the surrounding mountains but Serb troops hunted down and killed 6,000 of them. So far 6,610 victims have been buried at the Potocari Memorial Center. At last year's commemoration, 75 Srebrenica victims were interred at the site. This year, there were 35. Every year, the remains of more victims are identified and buried in Potocari on the anniversary of the genocide. Nearly 170 identified victims are in the Podrinje identification center in Tuzla, but largely due to incomplete remains the victims have not yet been buried. Hundreds of Bosniak families are still searching for missing loved ones, as a large number of victims were thrown into mass graves around the country during the 1992-1995 Bosnian War. A total of 8,400 people remain missing since the war’s end, according to the Institute for Missing Persons in Bosnia and Herzegovina.